Home / J.Crew / Sales / "The quickest way to know a woman is to go shopping with her"
"The quickest way to know a woman is to go shopping with her"
I may or may not have a problem. I vowed that after Christmas, I would greatly reduce how much I bought. And then the J.Crew sale happened. If I were to ever win a lottery, I can guarantee you that the majority of my winnings would be dedicated to a shopping spree(s) at J.Crew. That being said, I am happily awaiting my latest package. I may be a shopaholic, but there are worse addictions to have in life. I very rarely drink alcohol, so this makes up for my other lack-of -aholicisms. I was unable to resist the boots. 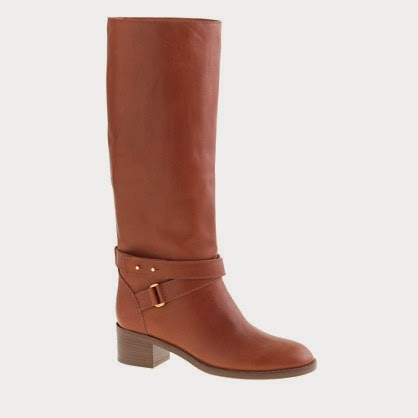 The Parker Boots were originally $420, went on sale for $291.99, and were then an additional 50% off. I received a prepaid master card gift card for Christmas, and was having so much trouble using it online, I ended up doing a phone order. The card still didn't work, but they offered me free shipping after all the hassle, so I put the item on my regular visa and I'm ecstatic that I did. The boots arrived today (poor CanadaPost delivery man who had to trek out in the -33 degree weather to deliver them), and I'm so in love. They are such a rich, beautiful colour and texture. The only downside is that they don't have any tread (which is alway on my must-have list, but they were too nice to pass up on). Last night, while in my first class of the semester (night classes are the worst), my friend and I were looking on the J.Crew website and I found that the Jewelled Fair Isle sweater was back in stock, in my size. I didn't think that it would still be available once I got home (given that I still had an hour of class remaining, plus a 40 minute commute), but to my surprise, it was. I rushed upstairs and bought the sweater. Part of me is regretting the purchase, given that it still cost about $100 with tax and shipping, especially since I want to get my hair done again, but the other part of me is beyond excited. I've wanted this sweater since I first saw it a few months ago. I would hold it up in stores and give my mom my perfected puppy-dog face, but she wouldn't bite. Let's see if I can actually go until my birthday (early March), without buying myself anymore clothes (skin care and makeup don't count in my books).